WHO CAN STAND: Growing Your Blog While Managing Your Home - Review and GIVEAWAY! Growing Your Blog While Managing Your Home - Review and GIVEAWAY! I've been blogging on and off since my university days. Really it's been more like "dabbling" than "blogging". I like to write and it seemed like a fun thing to do - so I jumped on the bandwagon. However, without a focus, and without a vision - each of my previous attempts quickly dwindled. It wasn't until after I was married (almost 3 years ago), that with the encouragement of my husband I considered taking it up in a more serious matter. 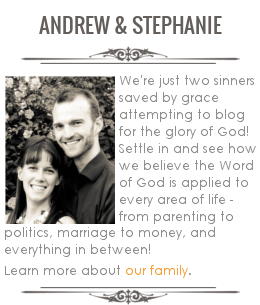 It is a passion of both of ours to encourage other Christians, and blogging seemed like a great platform for doing so. But I think without the friendship of Jacinda (who blogs at the very popular Growing Home), I never would have had the nerve to really jump in with both feet! My husband knew Jacinda and her husband before we were married through the local homeschooling circles, and he mentioned that he thought we would get along - he was right! We have been so blessed to share in the sweet friendship of another young Christian couple whose convictions line up so similarly with ours. When we saw what a positive impact Jacinda was able to have for the glory of God through her blog, we were excited about doing similarly. With her encouragement, and certainly with her practical advice - we decided to go for it - and that's a large part of what you see here at WHO CAN STAND today. 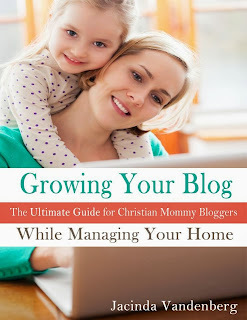 And so I am VERY excited to be offering you an opportunity to read her new e-book Growing Your Blog While Managing Your Home - because I can tell you, she's the real deal! I've been to her house - and she manages her home! Her husband and her share a vision for the family economy, which she deftly employs while carrying out the noble task of mother to her three darling children. If you are just starting out blogging, and considering making it more of a opportunity to bless your family financially - than there is no better resource for you than Growing Your Blog While Managing Your Home. Tackling the subject from a Christian mother's perspective, who understands her role as helpmeet, mother and homemaker, I truly believe this is a unique resource. In the first section, Jacinda begins by challenging you to ask the questions "To Blog or Not to Blog", noting that it is of the utmost importance we have our priorities in line. She shares her own daily schedule, a lengthy list of practical time-saving homemaking tips - and then lest you think she is wonder-woman - she shares another list of things she doesn't do (iron, dust weekly, bake homemade bread, etc) - a pretty funny read! As well, much of what has become second blogging nature to me now is practical advice I took from Jacinda's section on Content and Design. She tackles topics like titling your posts, editing photos, finding inspiration, and ideal lengths for posts. As well, she includes her own little snippits of html code, which make it so that even you (yes you!) can customize the look of your blog beyond the usual templates you find on Blogger or Wordpress. In the section on Growth and Monetization, she tackles how to use all the big social networking sites (Facebook, Pinterest, Google +, Twitter) to your advantage, as well as providing detailed guidelines and tips for the various ways you can make money through your blog. It is clear that Jacinda is sharing tried and true wisdom, and its wonderful to have all this advice in one place! All this to say, you will be well prepared to face just about any blogging challenge with Jacinda's e-book in hand. For the rest of this week, it is on sale for HALF PRICE - only $3.99. You can also enter below to win a copy, and if you do, but you've already purchased one, Jacinda will refund you the cost. So buy your copy now, because after Saturday (when the giveaway also ends), the e-book will be back at it's regular cost of $7.99 (still well worth the price)! I just found your blog through a link-up, and I'm so happy I did! I just clicked around, and I love your stuff. Good to meet you friend! Your blog is a great encouragement! I'm looking forward to the giveaway and please thank Jacinda for the option of refunding those that have already purchased the e-book. I'm hoping to start it tonight! Is it wrong for LEGO to market to girls? Who is it blogging back here?